Spain international Cesc Fabregas is unperturbed with the additional competition from Tiemoue Bakayoko for the midfield role next season. Bakayoko joined the Premier League holders from AS Monaco earlier this month after they paid up a £40m package for his services. 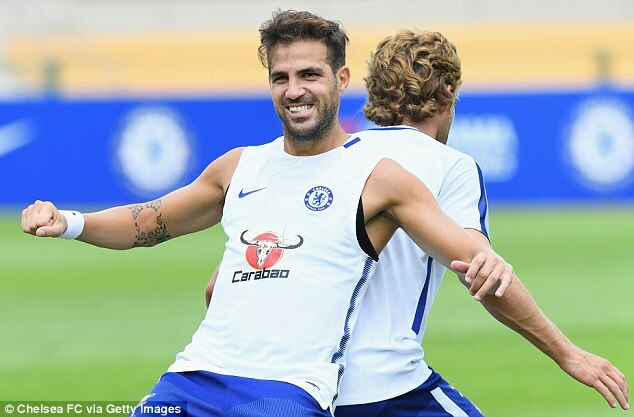 Bakayoko is due to miss the start of the campaign with a minor knee injury, but Fabregas has stressed that he is not worried by the Frenchman's arrival at Stamford Bridge, he said: "I have been competing for 15 seasons. That will not put me down after what happened last season and how I stood up to it. I'm ready for anybody. I feel great. I understand the philosophy of the manager very, very well. I know what he wants from me." Fabregas managed just 13 starts in the Premier League last term, but he still maintained a fruitful bond with Antonio Conte, who assured him a prominent role in the future. Nemanja Matic is expected to leave the Blues before next month's transfer deadline, and this will allow Fabregas to slot into the lineup from the start of the season. Meanwhile, Blues boss Conte has offered more encouragement to the former Arsenal man, who he sees as the perfect number 10 in his lineup. The Italian head coach is considering a potential change to his preferred 3-5-2 formation next season, and this could see Fabregas in a more advanced role - something which he enjoyed during his time at former club Barcelona. With the World Cup coming along next year, Fabregas will want to secure regular first-team football after he was dropped from recent Spain squads. Despite his reduced playing time last term, Fabregas was successful with his displays - netting seven goals and assisted a further 13 across all competitions. Chelsea suffered their second straight pre-season defeat against Inter Milan on Saturday, and this could be a cause of concern ahead of their Community Shield game against Arsenal next weekend.